The Division of Student Affairs has informed Student Government of changes being made for the 2018-19 school year. 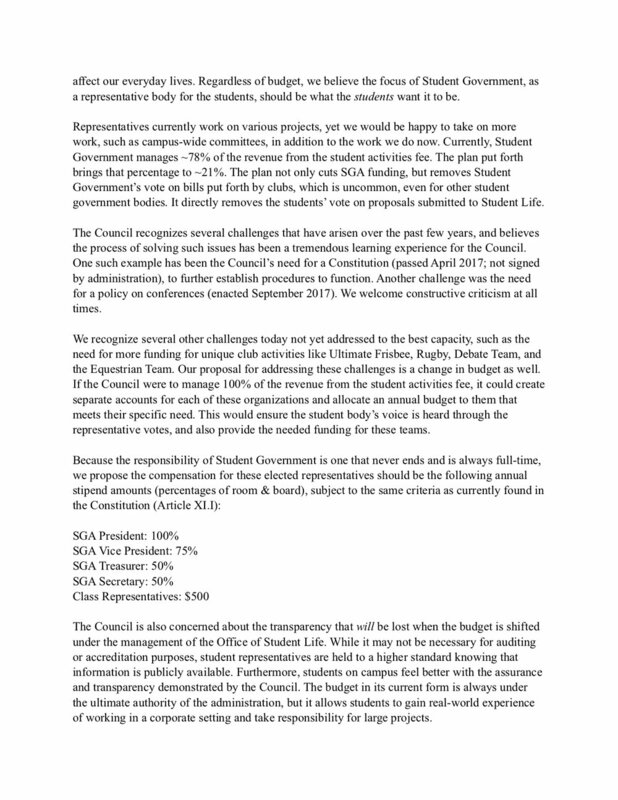 Today, Student Government serves as a voice for the students to the Administration, as well as the governing body of a majority of the Student Activities Fee. Most colleges have a fee just like this, and most have their student government manage it. As it stands, our SGA has a substantial portion of this fee, and we're very grateful for this. It's a sign of the Administration's support for the students here. They allow us to hear your concerns, propose solutions, and directly make a difference by investing in solutions. Many of our peer schools are inspired by this and are working to change their models to be more like ours. We love it - because we truly enjoying working with you and making your ideas a reality. Over the last several years, we've worked hard to redesign our budget from scratch, making it super accurate and transparent, and we've revamped our website and submission system to make requesting funding as easy as possible. This year, we've processed 87% more bills than last year. This means more students are getting involved, including you. You've each been a partner in this journey to build up Ave.
We've been informed that the Administration is making a change to this approach, and plans to cut Student Government's budget substantially - estimates currently around cutting it by 2/3. Student Affairs will tell you this is going to help you. We strongly believe this is not true. Not only does SGA have the responsibility to spend our current budget wisely, but we do so to a much higher degree because we're one of you. We care about this place like you do because every decision directly affects us. If you've worked with Student Life before, you probably don't need any further explanation. To clarify, they're not actually cutting the budget - they're just shifting who has the ability to spend it. Instead of the Council voting on proposals, Student Life alone will make the decisions on what moves forward. If they don't agree with your idea, you won't have an opportunity to present in front of students. They would be able to put this funding into whatever they feel is best, potentially without any student input, and without anyone even knowing about it. It's a real blow to the way our system is so open today. Again, we believe our openness is a strength. We’re not a perfect Council, but we’re with you, and we’re constantly striving to make this school better. One additional change they are making is to reduce the SGA Executive Board stipends. Currently, the President receives 100% and the VP, Treasurer, and Secretary receive 50% of room and board as a leadership scholarship. The plan is to reduce the President to 30% and the other Executive members to 15%. They argue that if we fight this change this we are only fighting for ourselves. We feel that you deserve to at least know this. We, of course, are saddened by this change, but please know that our intentions go far beyond only our own bills. We believe this change will significantly affect student involvement, from the representatives to club and household leaders. Our students are our greatest asset, and we believe the more they are involved, the better. Cutting out the reps from voting will distance them from events going on. In addition, it eliminates the accountability the Council serves to ensure that you’re being advocated for. We think the Student Activities Fee should be managed by the students (and of course, overseen by Administration). Below are our official communications with the Administration. We will be hosting a town hall on Tuesday, March 27, at 9 pm in the Private Dining Room. We invite all students to join us to ask for clarification on this issue. Have feedback on how this can be better? Let us know here.